It's the ultimate stadium rock tour as Journey & Def Leppard team up for the co-headlining tour of a lifetime! 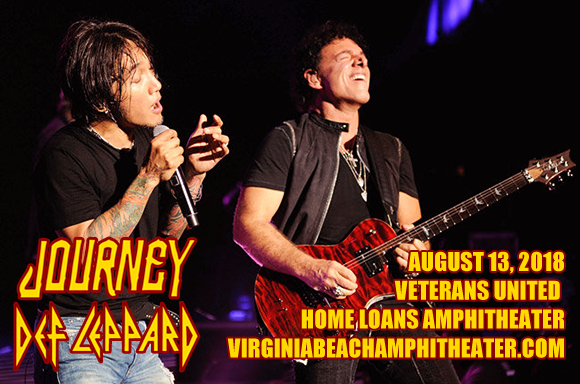 Coming to Veterans United Home Loans Amphitheater on Monday 13th August 2018, the show will see these two titans of rock (who previously toured together in 2006) performing from their extensive back catalog of epic tunes and all the classic hits that made them legends! So backcomb that hair and get ready to rock hard! American rock band Journey began their career in 1973 in San Francisco, starting out as a progressive rock/jazz fusion act known as the Golden Gate Rhythm Section, comprising of former members of Santana and Frumious Bandersnatch. Shortly after changing their name, the group signed with Columbia Records, releasing their first three studio albums in 1975, 1976 and 1977 respectively. 1978's Infinity ushered in a new era for the band, and with a new lead singer, a new producer and a new sound that took on a more pop/rock influence, Journey went on to have seven consecutive multi-platinum albums from 1978-1987. The albums launched a string of hit singles including 1981's Don't Stop Believin', became the top-selling track in iTunes history amongst songs not released in the 21st century in 2009. Journey are one of the world's best-selling bands of all time with worldwide sales have reaching close to 90 million records.